Please enjoy the “WHITE, HOT, COOL” slideshow from last week’s “Party in the Kitchen” featuring 17 of Atlanta’s Top Chefs, co-chaired by Sally Dorsey, Tony Conway, and Todd Tautfest. Photography and slideshow by Laura Stone of ArtStar Photography. This entry was posted in laura stone, open hand, sally dorsey, todd tautfest, Tony Conway. Bookmark the permalink. Last night, approximately 300 guests attended “Party in the Kitchen,” at the Mason Murer Main Gallery to benefit Open Hand. Guests enjoyed delicious cuisine from seventeen of Atlanta’s Top Chef’s including A Legendary Event’s Executive Chef Lincoln Stevens, Dogwood’s Shane Touhy, Gary Mennie of Livingstons, Peter Kaiser from Twist, Rathbun’s Kevin Rathbun, Craft’s Kevin Maxey and Shaun Doty of Shaun’s. Some of the menu items included Bacon Molasses Ice Cream with Peanut Butter Foie Gras Mousse, Grilled Calamari with Peeled Pea Salad, traditional European Bangers and Mash, and a plethora of delicate and delicious desserts. 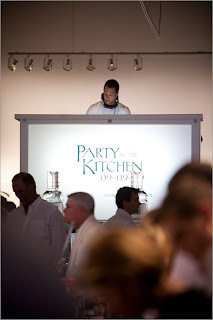 Framed iconic images, stainless steel chef stations, white carpet runners and modern lounge furniture exemplified the party’s “White, Hot, Cool” theme. Live auction items included travel and entertainment packages, fine dining experiences, and one-of-a-kind items such as eco-vintage jewelry by Mark Edge and an acoustic guitar autographed by the South African grunge-pop band Seether. Party in the Kitchen Co-chairs Sally Dorsey, Tony Conway, and Todd Tautfest were overjoyed with the turnout. “I was so honored to be asked to co-chair this event. Working with Sally and Todd is always a wonderful experience and it touches my heart to see so much support for such a worthy cause,” Tony Conway said. 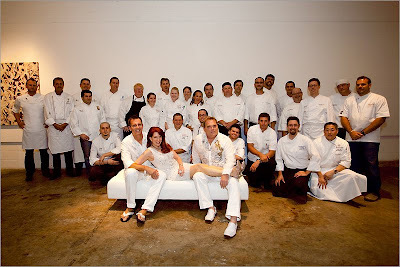 This entry was posted in A Legendary Event, open hand, party in the kitchen, sally dorsey, todd tautfest, Tony Conway. Bookmark the permalink.